The District's educator has worksheets, education materials and teacher guides available for classrooms in Cuyahoga County. Items include Early Education Worksheets and the Mission: Recycle Newspaper for students in grades 3-4. 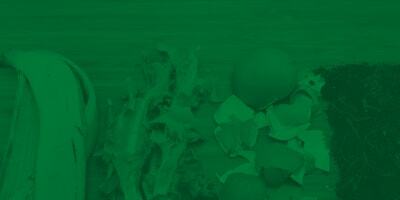 See more about our education programs for youth and schools. Youth learn how to reduce, reuse and recycle correctly in Cuyahoga County. This newspaper is intended for students in grades 3 - 4. A teacher guide is included. 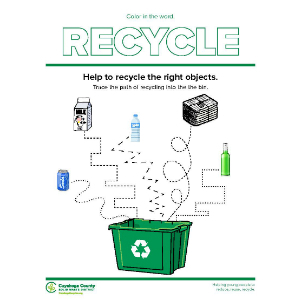 Request copies of the Mission: Recycle Newspaper + Teacher Guide for your classroom by contacting District educator Kathy Rocco. Mission: Recycle newspaper, third edition (2018). Available in hard copy. Mission: Recycle newspaper, second edition (2017). Available in hard copy or see the PDF. Mission: Recycle newspaper, first edition (2016). Available in hard copy or see the PDF. Early educators teach the youngest recyclers. 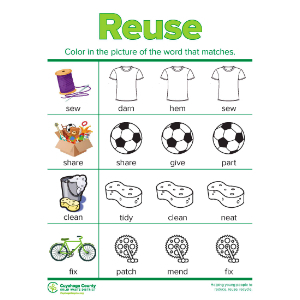 The Solid Waste District offers a series of early education worksheets that allow kids to practice motor skills, math, language, and thinking skills while focusing on the sustainable material management known as reduce, reuse and recycle. Working with other early educators, the District created a series of worksheets to use in the classroom. Consider using the worksheets with lessons, during free time, or as extras during bell work. If time is limited during school or daycare, consider sending the worksheets home with students. 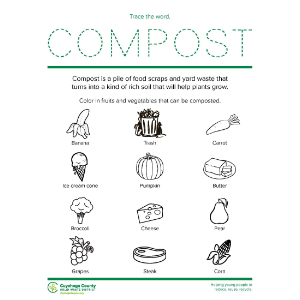 By using the worksheets during a child's early education years, parents and educators can pass along good environmental habits like reducing waste through using less, reusing, recycling and composting. Feedback is welcome! 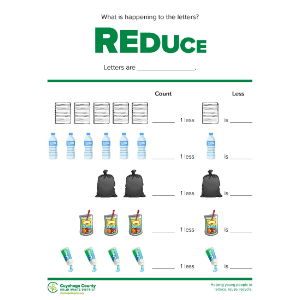 Tell us if you like the worksheets and how you will use them in your education program. 4 pages, view the PDF. 6 pages, view the PDF. 3 pages, view the PDF. 5 pages, view the PDF.